The premiere of Fantastic Beasts and Where to Find Them is right around the corner. 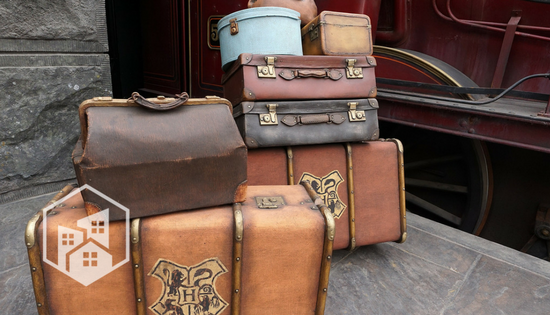 Whether you’ve read every book in the Harry Potter series or you’re still learning your first spell, we’ve got four eco-friendly steps to get you ready for Rowling’s latest adventure. No transfiguration charms required. It’s a quick read. It’s a J.K. original. And no trees were harmed in the making of the e-book. Fantastic Beasts and Where to Find Them is a textbook title mentioned on Harry Potter’s Hogwarts school supply list. In 2001, J.K. Rowling published a real-life version of this textbook (purportedly written by fictional character Newt Scamander). If you’re the kind of person who prefers to read the book before you see the movie, it shouldn’t be too hard to track down a physical copy of Fantastic Beasts. Thunderbird – Intelligent but temperamental. The Thunderbird can create storms as it flies. It’s no surprise that this house is home to adventurous students. Horned Serpent – Scholarly and enigmatic. The Horned Serpent is said to represent the mind of an ideal wizard. The giant jewel set into its forehead adds even more mystery to the mix. Wampus – Argumentative but fiercely loyal. The Wampus is a panther-like cat that’s fast, strong and virtually impossible to kill. Warriors only beyond this point. Pukwudgie – Independent and protective with a desire to heal. The Pukwudgie played a critical role in Ilvermorny School’s origin story. And it definitely has the coolest name. 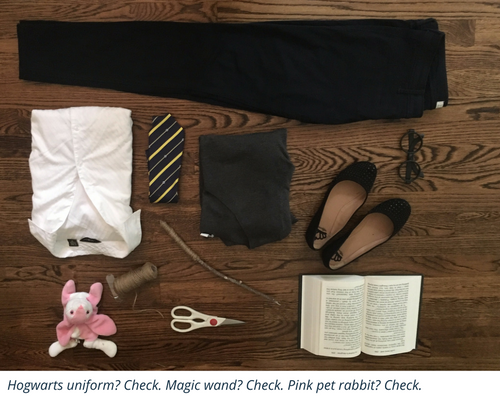 Unfortunately, muggles haven’t quite mastered the Summoning Charm – a new set of robes won’t just appear. However, it’s easy to conjure up a costume using what you’ve got around the house. MAKE YOUR WAND. Go scavenging for a foot-long stick in your backyard. The more imperfect, the better – every wand is unique. Use pliers or scissors to pare down your branch. Then, add a grip by wrapping the string tight around the bottom fourth of your wand. When you’ve finished, tie a knot and cut away the remaining string. DON YOUR UNIFORM. Button up your white shirt and layer the sweater on top. Tie your tie tight (this might take a few tries). If you have a graduation robe lying around, it’d make a great overcoat. ACCESSORIZE. In the Wizarding World, everybody has a pet. I happen to have a pink rabbit. But rats, cats, toads and owls all make great sidekicks. If you’re more scholar than Quidditch star, grab some Harry-inspired glasses and a leather-bound textbook to complete your look. Grab some popcorn-flavored Bertie Bott’s Beans and go see Fantastic Beasts in theaters starting Thursday, November 17. 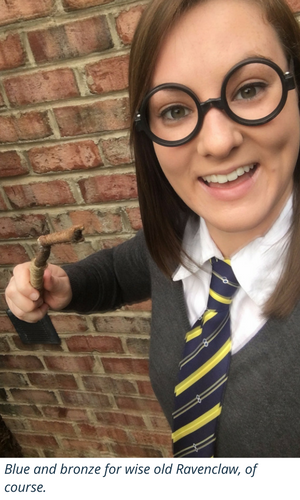 Armed with an e-ticket, a striped tie and your trusty wand, you’ll be the envy of muggles everywhere. The best part? You did it all sustainably. Forget Gryffindor – 200 points to you.